Our department of Theoretical Physics and Computer Modelling (TPCM) is well known Internationally in the field of computational materials science. 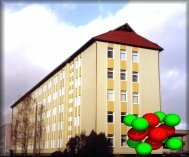 TPCM is a leader in the Baltic region in the large scale first principles modeling of the atomic and electronic structure of technologically important materials with a focus on nano-materials, defects, surfaces and interfaces (see publications on the homepage, as well as recent books: E.A. Kotomin, K. Sickafus, Radiation Effects in Solids, NATO School Proceedings, Kluwer, 2006; E.A. Kotomin and C.R.A. Catlow, Computer Modeling of Materials, Kluwer, 2001). This activity is accompanied with the study of many-particle (cooperative) effects in the kinetics of bimolecular reactions in condensed matter, including radiation defects. Most of this research is based on a novel formalism of many-particle densities described in the book [E.A. Kotomin and V.N. Kuzovkov, Modern aspects of diffusion-controlled reactions (Amsterdam: Elsevier, 1996)]. Surface-induced reactions are known to play a very important role in heterogeneous catalysis and solid oxide fuel cells transforming chemical energy directly into electricity with high efficiency and in an ecologically clean and safe way. We study these reactions with emphasis on such fundamental phenomena as pattern formation, reactant self-organisation, regular and irregular reactant concentration oscillations as well as chaotic behaviour in the case of simple reactions on low-index crystalline surfaces and nano-materials. The TPCM is well recognized internationally, we publish 30-35 papers a year in leading physical and chemical journals. The high quality of our research is also confirmed by the department current participation in 5 International projects in the field of nano-materials and ecologically clean new energy sources. These projects include: Euratom-Latvia Fusion project where high power girotrons for plasma heating are developed and new construction materials for the first-reactor-wall exposed to an intensive radiation and high temperatures (e.g. in Tokamak-type thermo-nuclear reactors) are modelled; FP7 Catherine project focused on development of advanced nano-tubes, nano-connects and their architectures for nano-electronics; FP7 F-bridge project dealing with development of new nuclear fuels for fission-type (atomic) reactors of the new generation-IV; FP7 NASA-OTM project focused on the development of new ceramic membranes for gas separation and CO2 trapping in gas exhaust of the fossil fuel plants (Zero-CO2 emission International activity); ERA-Net MATERA project dealing with a new generation of non-volatile high capacity memories; FP7 Cacomel project focuses on linear and nonlinear electromagnetic effects in nano-carbon structures. Department publications and citation for the last 20 years (from Web of Science). All these activities fit perfectly to the Latvian Research Council scientific priorities for a period of 2010-2013. For instance, with 11 people in our department involved in these activities (thus consisting less than 5% of scientists in Latvia working in materials science area) we published 140 papers, i.e. 27% of publications in the last 5 years and constitute 27% of young scientists received PhD in this period. Our computer modelling is of a key importance for the interpretation of numerous experimental data (e.g. EXAFS spectroscopy), separation of the processes in the bulk and on surfaces of materials (e.g. catalysis which practically impossible to handle experimentally) and detection the rate-determining reaction steps in complex reactions which opens the way for new materials and advice improvements. Another activity is related to the theoretical plasma physics and gyrotron development for fusion reactors. Our state-of-the-arts large scale massive parallel computer modelling combines use of the first principles quantum mechanical computer codes ABINIT, VASP, CRYSTAL which we combine with the thermodynamic analysis, pair potential approach, molecular dynamics, kinetic Monte Carlo and simpler formalisms. This permits to obtain reliable the atomic-electronic structure of complex advanced materials and to get the multi-scale picture of complex physico-chemical processes under study in the above-mentioned activities. The common feature of all these activities is use of modern high performance computing.